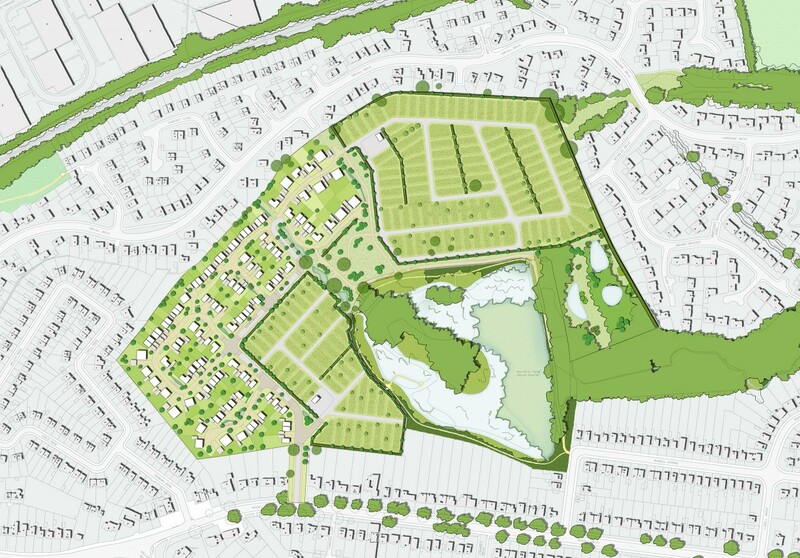 A proposed development in Wollaton, Nottingham encompassing up to 110 new homes, 180 improved allotments, facilities, open public spaces and a nature conservation area. Also enhancements of Bilborough Brook, improving its flow to reduce localised flooding in the allotments and pollution around Martin’s Pond, a Local Nature Reserve. Commercial Estates Group appointed Influence to lead the development Masterplan; they were keen to give residents the opportunity to connect with the natural environment and to fashion a range of ecological enhancements by promoting and protecting existing habitats. In May 2014 the Planning Inspectorate approved the scheme. Influence acted as the Expert Witness on landscape design and landscape and visual elements of the scheme. These were key determining factors in the Inspector’s approval decision. Influence were retained to provide the lead design services for the discharge of Reserved Matters and Landscape Design Conditions for the allotment aspect of the development. Influence also provided Architecture Services to Pre-Application stage and landscape design support services to the house builder’s residential Reserved Matters application.